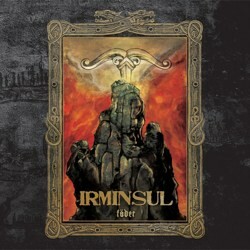 Swedish folk metallers Irminsul are back with a surprisingly versatile and multidimensional album! This trio from Gothenburg was formed in 2005 and released the demos “Vinterskalder” in 2006 and “Urberg” in 2007. They signed to the German label Det Germanske Folket in order to release their debut full-length album “Irminsul” in 2009, an album that contained all demo songs, plus 3 new tracks. Four and a half years later the band is back with its second full-length album “Fäder“, released on December 2013 via their new label Purity-Through-Fire, again from Germany. Since their debut album, Irminsul play folk metal with the characteristic Swedish “color” in their sound, moving between folk pagan death black metal and classic folk metal, experimenting with a large vocal canvas. ”Fäder” continues in the same musical style, but this time the experimentation goes even further! They have perfected their production, with a professional crystal clear sound and a much more “mainstream” approach. The band has really rich orchestrations, with wonderful acoustic and distorted guitars, classical and traditional instruments, as well as several symphonic elements. Except for the metal instruments, everything else is programmed (they don’t use authentic instruments), but they have done an amazing job and everything sounds very natural! Once again they sing in various styles, ranging from black death metal screams to clean vocals and choirs. All vocals are very good, especially the clean ones, both by Robin (guitars, vocals) and by their fantastic female singer Linda, who has a very important role in the album for a guest member! She has a very personal “sweet” and smooth color in her voice, adding a different quality in their compositions. The band has now a much richer sound, that is really hard to describe, since they borrow elements from many different genres outside their pagan folk metal roots. Their sound is influenced deeply by epic and symphonic “female fronted” metal, with several progressive metal and acoustic folk elements. The whole album is quite variable, but there are 2 compositions where the band experiments more than expected! The first one is the 11-minute saga “Clades Variana“, a power metal (!) song dealing with the battle of Teutoburg Forest in the beginning of 1st century, where Roman legions suffered a big defeat. The second one is the cover of Limahl’s “Neverending Story“, a new-wave synthpop song from 1984. Irminsul have metalized it, but they also kept many of the original synthpop elements! As you can already assume, “Fäder” is not a concept album, since its lyrics deal with various themes, varying from Scandinavian mythology, Roman history and medieval legends, to fantasy themes and humorous lyrics. Some of them are in Swedish, others in English and you can find them all in the CD booklet. Irminsul’s new work is many steps forward in every level compared to their debut album. The band continues to experiment and explore various musical paths, being surprising good in all of them. There are a few parts though that it’s like you are listening to a different band inside the same album. I would prefer a more solid “sound identity” from start to end, but that’s only my personal opinion of course. Overall it is a very good effort, totally recommended to all open-minded folk metal fans. “Fäder” is released by Purity-Through-Fire in two different editions. A standard jewel case edition with 12-page booklet and a limited to 200 hand-numbered copies A5 digipak edition with the same booklet. 100 of these A5 digipaks come with t-shirt and patch, available only as part of this package. The amazing artwork and design is by Samos of Folkingrimm Art. You can follow their official pages below for more info and sound samples.